The very first Paris-Rouen race took place on this day in 1869, making it one of the oldest official and organised bicycle races in history - and, it's believed, the first bike race to be held between two cities. The winner, taking 10 hours and 40 minutes to complete the 123km, was James Moore, an Englishman who had been born in Bury St.Edmunds in 1849 but grew up in Paris; he received a huge prize of 1,000 gold Francs. 120 people, among them two women, started the race, but 24 hours after the start only 32 had finished - including one of the women, who had entered as Miss America (she was in fact English, and her real name was Mrs. Turner - bicycle racing, in Britain and elsewhere, was not considered to be a sport befitting gentlemen, never mind ladies, and the idea of women taking part in public athletic competition was widely frowned upon; Mrs. Turner therefore felt the need to conceal her identity - a great pity, as it means we know nothing more about her) and crossed the line in 29th place after 22 hours and 50 minutes. The race had been inspired by the popularity of a shorter event at St-Cloud in Paris the year before, an event that Moore also won and which is often - despite convincing evidence of earlier events - said to have been the first organised bike race in the world. A day after that, he won Britain's first organised race at Brent Reservoir, near to which he is believed to be buried. 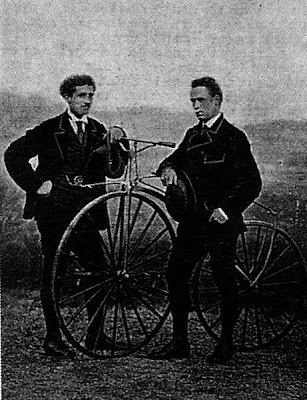 The race - which imposed some strict rules, such as banning riders from being towed by dogs or fitting sails to their bikes - was organised by a magazine, Le Vélocipède Illustré, and businessmen the Olivier Brothers who are usually credited as being the first to realise the commercial potential of the bicycle and the first to begin mass-producing them after going into partnership with Pierre Michaux. Michaux, a blacksmith, had invented the velocipede (briefly also known as a "Michaudine") when he came up with the idea in the early 1860s of adding pedals* to the draisienne, the hobby-horse that had changed little in the half-century since Karl Drais** invented it - curiously, Moore had befriended the Michaux family in Paris during his youth. *Just as nobody knows for certain if the race in St-Cloud was the world's first or where Moore is buried, nobody really knows if Pierre Michaux really was the first to think of fitting pedals to a draisienne to make a velocipede. It might have been his son Ernest, or even by Pierre Lallement who may have come up with an earlier design and later had connections to the Olivier brothers, and possibly even worked for Pierre Michaux for a while. **For that matter, we don't know for certain that Drais invented the hobby-horse, either. He might have been copying something he'd seen. Born in Bolzano on this day in 1968, Italian Antonella Bellutti was a distinguished athlete in her youth, winning seven Junior National titles for the 100m hurdles and setting a national Junior record. Later, she fell in love with cycling and took second place in the Individual Pursuit at the National Track Championships in 1992, then won the event and the National Individual Time Trial Championship on road two years later. In 1995, she won the Pursuit at the Manchester round of the World Cup and at the National Championships where she also won the 500m, then came second in the Pursuit at the World Championships and managed ninth place at the Trofeo Alfredo Binda. 1996 would be an excellent year: she won the Pursuit at the Cali round of the World Cup, the Pursuit and 500m for a second year running at the National Championships, took second place in the National ITT Championships, third place in the Pursuit at the World Championships and won the Pursuit at the Olympics, beating Marion Clignet and Judith Arndt. In 1997, Bellutti win the Pursuit at the Adelaide, Cagliari, Fiorenzuola d'Arda and Cali rounds of the World Cup and began to dominate in the Points race too, winning it at Athina and Cali. She also won the Omnium at the European Championships before going to the Nationals, where she won the Pursuit, Points, 500m and Sprint, and kept the Pursuit and 500m National titles the following year, also winning the Pursuit and Points at Cali. Bellutti made a return to road racing in 1999 and won the Giro Pordenone shortly after taking a bronze in the Points at the Moscow round of the Track World Cup. The middle part of the year was based on the track again and she won the 500m, Points and Sprint, then went back to the road and came third at the Chrono Champenois. In 2000, having won the 500m and Pursuit (and come second in the Points) at the National Championships, she went to the Olympics and won gold in the Points race before calling an end to her cycling career - two years later, at the Winter Olympics in Salt Lake City, she came seventh in the two-woman bobsleigh event with Gerda Weissensteiner. In addition to showing talent in several very different sports, Bellutti has turned her hands to some very different jobs: between 1992 and 1995 she was a physical education teacher, then some years later she contributed several articles to newspapers and was included on the national register of journalists. In 2001 she was elected to a position on the Italian Olympic Commission and, a year later, became technical director of the men's national track team (a role she gave up as it was seen to conflict with her role at the Commission). In 2003, she was athletes' representative at the national anti-doping agency, and since 2012 she has been one of the chief organisers of the XXVI World Universities Winter Games, due to be held in December 2013. Happy birthday to Tanya Dubnicoff, the retired Canadian track cyclist who represented her country in three Olympics and won four gold medals in the Pan-American Games. She now lives in California where she works as a cycling coach, training the Canadian national squad among many other teams. Hilton Clarke, who was born in Ormond, Australia on this day in 1979, has won a large number of events primarily at home, in New Zealand and in North America. In 2011, he became the first rider to win the CSC Invitational) twice. Known as a sprinter, he has ridden for United Healthcare since 2011. 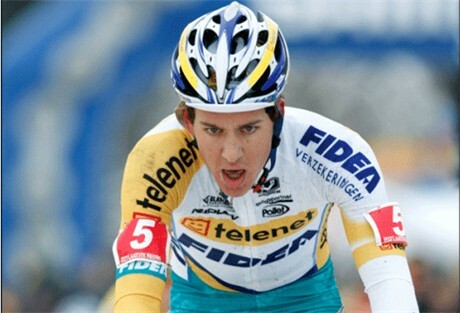 Tom Meeusen, born in Brasschaat on this day in 1988, won the Debutant's race at the National Cyclo Cross Championships in 2004 and the Junior National Cross Country Mountain Bike Championships of 2005 and 2006. In 2007, he won the tough Junior competitions at the Ruddervoorde and Koppenbergcross cyclo cross events, then in 2008 he became Under-23 National Cyclo Cross Champion and in 2009 he came third in the U-23 European Championships. 2010 was his first year at Elite level and he was third in the National 'Cross Championships. In 2011 he made a return to mountain biking and won a race at Averbode in Belgium, then another at Apeldoorn in 2012; in 2013 he kept up both disciplines and won a 'cross race at Zonnebeke, an MTB race at Steenwik and then in October the 'cross race at Marianne Vos' hometown Den Bosch. Meeusen has ridden for Telenet-Fidea throughout his career. This day in 2004 saw the inauguration of Sri Lanka's Cyclone, a mass participation bicycle rally aimed at establishing cyclist's rights and promoting the bike as a means of transport in the Asian nation. On this day in 1942, Fausto Coppi set a new Hour Record at 45.798km at the Vigorelli track. More cyclists born on this day: Per Kærsgaard Laursen (Denmark, 1955); Kenji Takeya (Japan, 1969); Emil Beeler (Switzerland, 1937); Pat Murphy (Canada, 1933); Harald Wolf (East Germany, 1955).